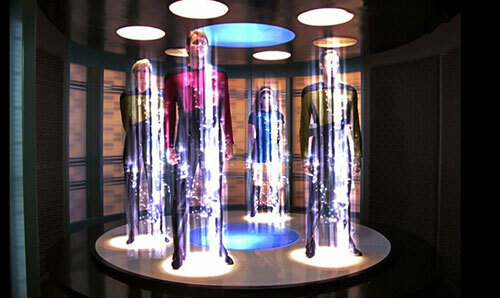 Physicists Achieve Quantum Teleportation - Beam Me Up, Scotty! "spin state of an electron to another electron about 10 feet away." Researchers at the Delft University of Technology (DUT) say they have teleported a quantum bit which can be represented in 2 places at once. This discovery is being hailed as a furtherance of quantum computing; which is still theoretical at this stage. "To achieve teleportation the scientists made use of an unusual phenomenon: entanglement. 'Entanglement is arguably the strangest and most intriguing consequence of the laws of quantum mechanics,' argues the head of the research project, Prof. Ronald Hanson. 'When two particles become entangled, their identities merge: their collective state is precisely determined but the individual identity of each of the particles has disappeared. The entangled particles behave as one, even when separated by a large distance. The distance in our tests was three meters, but in theory the particles could be on either side of the universe. Einstein didn't believe in this prediction and called it 'spooky action at a distance'. Numerous experiments, on the other hand, agree with the existence of entanglement." "Entanglement is arguably the strangest and most intriguing consequence of the laws of quantum mechanics. When two particles become entangled, their identities merge: their collective state is precisely determined but the individual identity of each of the particles has disappeared." can humans be beamed up like in Star Trek? "There is a big race going on between five or six groups to prove Einstein wrong. There is one very big fish. If you believe we are nothing more than a collection of atoms strung together in a particular way, then in principle it should be possible to teleport ourselves from one place to another. In practice it's extremely unlikely, but to say it can never work is very dangerous."